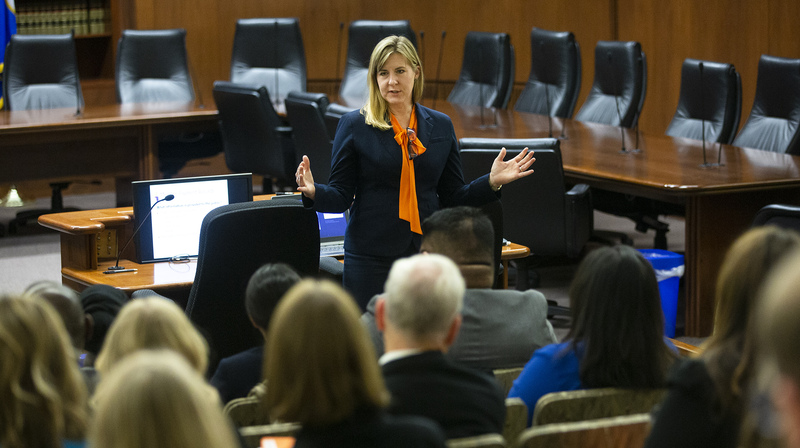 House Minority Leader Melissa Hortman (DFL-Brooklyn Park) was chosen Thursday by her fellow DFL caucus members to be the next speaker of the Minnesota House. During an evening meeting, the seven-term lawmaker was selected to preside over the House when the 91st legislative session begins Jan 8. “We completed the election for speaker and I’m gratified to have the support of my colleagues to be elected tonight as speaker-designate,” Hortman said. Hortman, who has held several leadership roles during her time in the House, including assistant majority leader and minority whip, told gathered news media she was not challenged for the speaker position. Hortman said the Legislature “has very significant unfinished business from the last session” and would quickly begin working on issues such as tax conformity, opioid and nursing home abuse, many of which were included in last year’s so-called “omnibus omnibus bill,” which did not become law. “There were a number of things that were almost unanimously supported that we should just peel out of [that bill] and get started on right away,” Hortman said. DFLers also chose Rep.-elect Ryan Winkler (DFL-Golden Valley) to be their majority leader during the upcoming biennium. Winkler, who was elected to his sixth term Tuesday, served in the House from 2007 until he resigned his seat in 2015 to move overseas with his family. Rep. Liz Olson (DFL-Duluth) was elected as the majority whip. The DFL gained control of the House after Tuesday’s election, flipping 18 seats to gain a 75-59 majority over House Republicans. The outcome of one race still in doubt could change those totals. However, the GOP retained control of the Senate, where they have a 34-33 advantage after prevailing in the special election to replace former Sen. Michelle Fischbach who resigned earlier this year to become lieutenant governor. Senate Republicans unanimously re-elected Majority Leader Paul Gazelka (R-Nisswa) earlier Thursday, and chose Sen. Jeremy Miller (R-Winona) to be the next Senate president. House Republicans are scheduled to meet Friday morning to choose the new minority leader. Current House Speaker Kurt Daudt (R-Crown) was reportedly undecided about whether he would seek that position.